. :: Welcome to Nairaschools Education Services :::: We Offer e-Registration & Payment Services for Yabatech Post UTME Form, ND/HND Part Time Form & HND Full Time Form. Also Includes e-Registration for NYSC, JAMB, WAEC, GCE & NECO. Sales of WAEC & NECO Scratch Cards also available :: Candidates can always visit our Office for Online Application... Wishing You All The Best. Thank You. NYSC Online Registration for 2018 Batch C Starts Oct 6th 2018 & Ends Oct 15th 2018. Our Office will be carrying out the e-Registration process for the 2018 Batch C prospective corps members. e-Registration for 2018 Batch C Starts Oct 6th 2018 and Ends Oct 15th 2018 at Shop 14, Bakassi Hall, Yaba College of Technology, Yaba, Lagos. 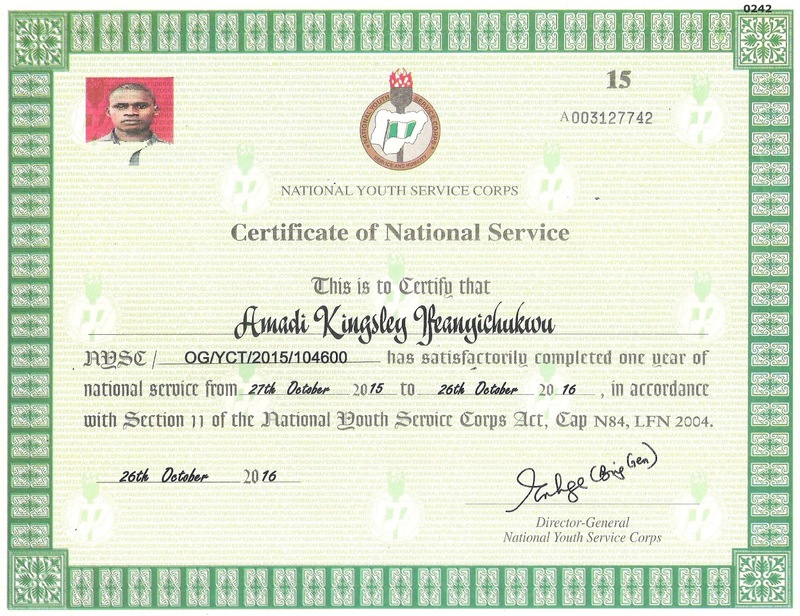 (NYSC e-Registration Centre). 1. Cost of Registration for all single Nigerian Graduates = N1,000 (e-Registration Fee Only). 2. Cost of Registration for Married Nigerian Graduates (Female Only) & All Foreign Nigerian Graduates = N2,000 (e-Registration Fee Only). Registration is handled by professionals in our NYSC e-Registration Office with experience in NYSC e-Registration since 2014 Batch C that NYSC mobilization moved from analogue to digital. We'll also enlighten you on what to expect in Camp and the documents required in Camp because we have passed through this same process as Corpers in 2015 Batch B Service Year. Payment of N2,786.24 for Call-Up Letter / Exclusion Certificate will be paid online with your ATM Card or at any Bank Branch. ZENITHBANK is available here, the payment is however not compulsory but very necessary. (Obedience is far better & even cheaper than sacrifice) We can also assist you with the payment if you want us to. Prospective Corps members interested in working with us as Ad-hoc Staff should come with their laptops, we'll give u internet access and pay you based on the number of persons you registered. You can earn more than N2,000 per day with this. You must have good knowledge of general internet and e-Registrations. You can call us on 08024102554 to book a slot. 1. Do not register by proxy (Your Bio-metric FingerPrint is Required), Registration takes approximately 15 to 20mins to finish. 2. Those that will be mobilized will get colored printout of their green card & list of items required on camp after registration & payment. 3. Those that will be Exempted or Excluded will get colored printout of their Exemption or Exclusion Certificate after registration & payment. 4. Visit Shop 14, Bakassi Hall, Yaba College of Technology, Yaba, Lagos. To Apply. Contact 08024102554. (NYSC e-Registration Centre). 4. High School Diploma or its equivalent. 5. First Degree or Higher National Diploma (HND) Certificate (Second Degree or Ph.D not necessary). Letter of attestation will not be accepted, Please. 6. Transcript of the first Degree or HND. 7. International travelling Passport showing data page and date of departure for the course of study. (Please note that you must present the originals of the above during verification at the Orientation camp). 8. Letters of verification for graduates of Institutions in Ghana, Benin Republic and any other Institution whose accreditation is in doubt. Visit us to get your application properly registered. This is to inform all Candidates who have chosen Yaba College of Technology as First Choice or Second Choice and also score 150 and above in the 2017 UTME that the 2017 Post UTME Form is Out. Registration Starts from 11th September, 2017 & Ends on 23rd September, 2017. Interested candidates should visit Our Office at Shop 14 Bakassi Hall, Yabatech Main Campus, Yaba, Lagos to apply in person, come along with photocopies of your JAMB Result, O'Level Result & One Passport Photo (White or Red Background). Kindly take note of our Office Address so as not to miss your way when u get to the campus. Only Applicants that applied directly with us in the school campus will be eligible for our Yabatech admission sms update (We'll keep updating you whenever there is any news for you). Cost of Form & Registration Fee is N3,500 Only. You can ask of Mr. Kingsley or WhatsApp 08024102554 when you gets to our office to apply. 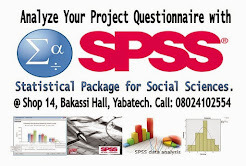 Our Office Address: Shop 14 Bakassi Hall, Yabatech Main Campus, Yaba, Lagos. NOTE All Candidates that registered with us and have their records in our office are advised to relax & feel free as you will be added to our Yabatech 2017 Post UTME WhatsApp Group where we'll keep updating you whenever there is news for you. Yabatech Part Time Form & HND Full Time Form for 2016/2017 Admission is now on sale. HND FULL TIME FORM & ND/HND PART TIME FORM FOR 2016/17 SESSION IS ONGOING. General entry requirements for National Diploma (ND Part Time): SSCE/NABTEB with at least 5 credits at not more than two sittings which must include English Language, Mathematics and 3 other relevant subjects. General entry requirements for Higher National Diploma (HND Full Time & Part Time): SSCE/NABTEB with at least 5 credits at not more than two sittings which must include English Language, Mathematics and 3 other relevant subjects plus a relevant National Diploma at not below Lower Credit Grade of 2.50 CGPA. All Questions relating to Submission of Academic Transcript will be attended to when you visit our office to apply. Interested candidates should visit Our Office at Shop 14 Bakassi Hall, Yabatech Main Campus, Yaba, Lagos to apply in person. Cost of Form & Registration Fee is N13,000 Only. The Fee covers for both Registration/Processing & Subscription for SMS updates from us, come along with photocopies of your O'Level Results, Birth Certificate & one passport photograph. Kindly take note of our Office Address above so as not to miss your way when u get to the campus. Only Applicants that applied directly with us in the school campus will be eligible for our Yabatech Admission guide WhatsApp & SMS updates, we'll keep updating you whenever there is any news for you. Interested candidates can contact Mr. Kingsley at shop 14, Bakassi Hall, Yabatech Main Campus for online registration and guidelines. After registration, you'll be added to our WhatsApp group where you'll be updated on a regular basis. You can call or WhatsApp us on 08024102554 when you gets to our office to apply. 1) Candidates for HND FT & PT from other schools who are not familiar with Yabatech procedures & behaviors are strongly advised to visit us to apply, we will not entertain questions and inquiries online or via phone calls when you start having complications during screening after acceptance fee payment. 2) We don't attend to any complaint relating to e-Payment problem such as dispense error or double debit via Calls, SMS or Whatsapp. 3) Applicants that are busy with work during the weekdays can also visit our office on Saturdays to apply and pay in person. We closes by 12pm on Saturdays. NOTE: HND Full Time & ND/HND Part Time Programs does not require JAMB UTME Subjects. This is to inform all part time students both weekdays and weekends that lectures starts officially on Saturday, April 30, 2016 for weekend students while lectures for weekday students will commence on Monday, 02 May, 2016. Students are advised to update their registration accordingly. You can visit Shop 14, Bakassi Hall, Yabatech to pay your school fees and print all documents necessary for your registration. JAMB 2016 CHANGE OF COURSE/INSTITUTION IS ONGOING. Send it to nairaschools@gmail.com You will receive a reply within 10mins, please read the message sent to you carefully and follow instructions; your request will be completed within 4hours from confirmation Of Payment. NOTE: Change of Course/Institution for 2016 UTME can only be done at JAMB Approved Registration Centers Nationwide. Cost of Scratch Card & Processing Fee is N3,000 Only. CLICK HERE to see a sample of JAMB 2015 Change of Course/Institution we have treated. We can help you get your Post UTME Forms without Stress. Unilag Admissions Guide By Timothy Ozovehe | Your sure guide into the prestigious university of Lagos, Nigeria.